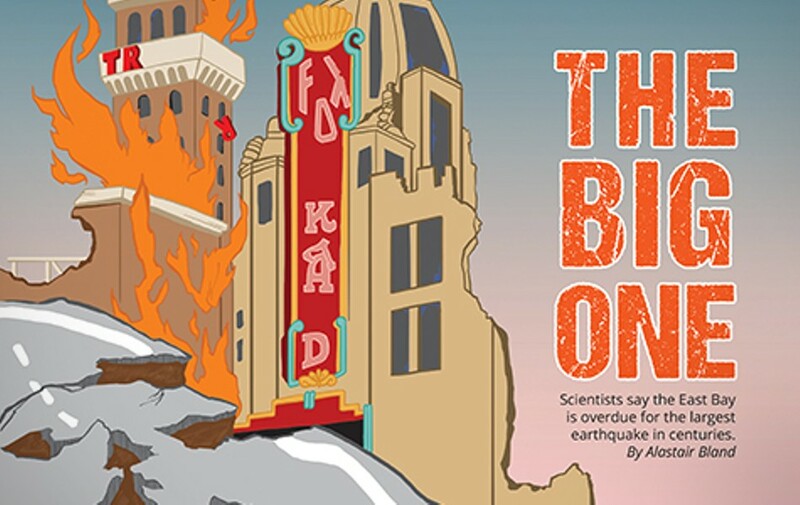 The Big One: Scientists Say the East Bay is Overdue for the Largest Earthquake in Centuries. And We're Not Prepared. A Hayward Fault shaker will be way, way worse than 1989's Loma Prieta quake. 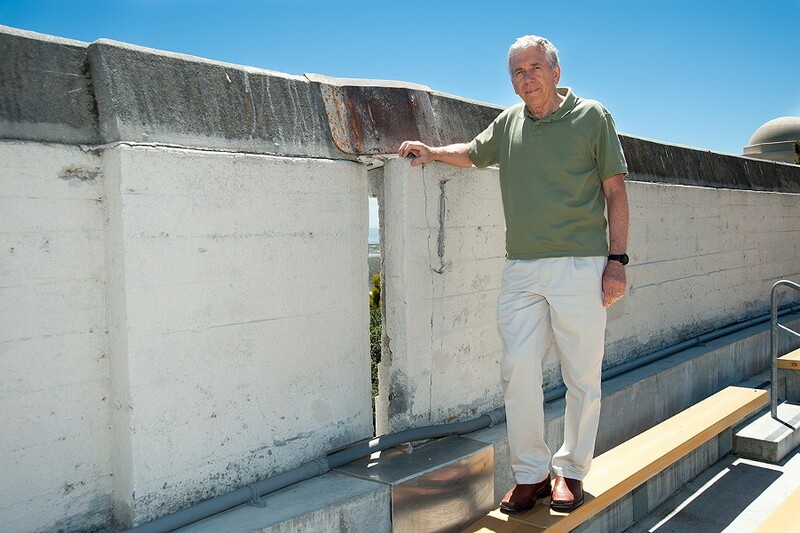 Tom Morgenstern UC Berkeley professor Nick Sitar shows the gap at California Memorial Stadium due to Hayward Fault movement over the years. The Hayward Fault splits the East Bay hills from the flatlands. Scientists say the zone is overdue for a major earthquake. Nicholas Sitar is a professor of civil engineering at UC Berkeley, and he likes to joke that "earthquakes don't come with due dates." Yet he and other scientists say it's only a matter of time — maybe days, more likely a few years — before a major Earth-shaking catastrophe hits the East Bay. Their words are not scare tactics. The Hayward Fault runs nearly right through the heart of the region, splitting the flatlands from the hills. This 74-mile-long zone has been quiet since 1868, when it generated its last large earthquake. But scientists explained to the Express that the average time frame in which a large tremblor occurs on the Hayward Fault is about 140 years. And that period lapsed in 2008. "Yes, in terms of the statistical average, we are now well past the average period between earthquakes," is how Sitar put it. This means that, in layman's terms, the proverbial Big One is overdue. Stanford University professor of geophysics Mary Lou Zoback, who has analyzed Bay Area earthquake hazards for years, warns it would be a grave error to assume that the '89 trembling was a sound assessment of the region's infrastructural integrity. She says that, when the Big One hits, thousands of buildings will fail their first true seismic stability test. Many will entirely collapse, crushing scores of office workers. Or, if at night, sleeping residents. "A repeat of the 1868 earthquake will be way, way, way worse than the 1989 Loma Prieta earthquake," he said. "There will be many people killed." Just about everyone who lived in the Bay Area in '89 remembers what happened on October 17. At 5:04 p.m., just as game three of the World Series between the A's and the Giants was beginning, the Earth shook so hard that the Nimitz Freeway collapsed in Oakland, killing 42 people. A section of the Bay Bridge fell, and a devastating fire erupted in San Francisco's Marina District. It seemed at the time like the Big One had struck. The next morning, the San Francisco Chronicle ran a headline claiming the earthquake had left "hundreds dead." It was a terrifying figure — and fortunately an overestimate. Sixty-three people died in that quake. In fact, the Loma Prieta shaker on the San Andreas Fault was not very large. It rang in at a medium-big 6.9 on the Richter scale — about the same as the Hayward Fault's 1868 quake, which killed thirty people. Since the Richter scale is not linear but logarithmic, the 1906 quake's 7.8 magnitude was eight-times larger and 22-times more powerful than the Loma Prieta upheaval, according to a calculation formula used by the United States Geological Survey. Moreover, neither the 1906 tremblor nor the Loma Prieta quake actually struck an urban area. The earlier one's epicenter was in northwest Marin County, and the '89 earthquake shook hardest in the Santa Cruz Mountains.